This is possibly one of the most frequently asked questions that I get when I’m in clinic, so I thought it was about time for me to write a blog about it, to help people understand why most health care practitioners may ask you to have a rest from gluten, especially if you are struggling with your health. Wheat and wheat varieties like spelt, kamut, farro and durum, plus products like bulgar and semolina, it is also found in oats, barley and rye. Gluten is the protein component of these grains, which help to make the grain strong and stick together when you mill it down into flour and make some of the common gluten filled foods like pasta, breads and most foods you find in bakery shops. 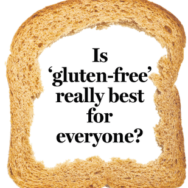 What’s so bad about gluten then? Well there’s nothing really bad about gluten as such, it can just be a very hard protein for some people to break down in their digestive system and if you can’t break the protein down in your digestive system then your immune system will try to jump in and create an immune response on the gluten protein to help you out and this can lead to all sorts of problems. Foggy mind, depression, ADHD-like behaviour, abdominal pain, bloating, diarrhoea, constipation, headaches, bone or joint pain, chronic fatigue and coeliac disease. So let’s look into these problems a bit more. This is when the body has a severe immune system reaction to the gluten protein, which causes damage to the small bowel. It can have devastating effects to the entire body and digestive system as the immune reaction causes the tiny finger-like projections, which line the bowel wall (called villi) to become inflamed and flattened. This reduces the surface area of the bowel available for nutrient absorption and can therefore lead to various gastrointestinal symptoms and malabsorption issues. It can also cause inflammation issues in other parts of the body, which are seemingly unrelated to the digestive tract and can go unnoticed in some people for a long time. Coeliac disease is often hereditary and is really common in people with a United Kingdom background but is not limited to that heritage alone. If anyone in your family history has coeliac disease then it is wise to rule it out of your own health picture with a trip to your GP for further investigations. A simple way to test for coeliac disease is with a coeliac screen, which is a blood test from your GP that looks for immune antibodies to the gluten protein. There is also now gene testing available as well, which looks for the HLA gene susceptibility and can determine if you have sensitivity to gluten even if you have been gluten free in your diet for some time. Coeliac disease is a serious medical condition and needs to be diagnosed accurately and then professionally supported, including strict diet modifications for the optimal health, longevity and well-being of your body. Abdominal pain, diarrhoea, bloating and excessive wind, as well as lethargy, poor concentration and general aches and pains. If you are experiencing any of these signs and symptoms then you need to see your health care practitioner to rule out coeliac disease. If you are not coeliac then trialling a gluten free elimination diet is the next step. The general rule of thumb is to avoid gluten 100% for a minimum of 4 weeks, during this time it is helpful to keep a food diary of what you are eating and the following reactions of your body, particularly digestively after you have eaten. It is important to keep an eye on your energy levels after you have eaten, for example if you feel extremely tired after food and feel like you need to have a sleep then this is important to note down. But no more than 1x serve only! Then you need to wait 3 days before you consume any more gluten. This is important because it can take the immune system up to 3 days to have a noticeable reaction to the gluten protein. I recommend working with your health care practitioner during this experiment and I have to say that naturopaths are particularly good at guiding you through this process and helping you to understand the outcomes and what to do next. While many people can tolerate gluten, they can still have a hard time digesting wheat. I believe the main reason for this is that wheat is a hybrid grain that was derived from the spelt grain. It has been genetically modified in Australia for many years, which increases the strength of the gluten protein. In fact wheat has been shown to have 3 times as much gluten per serve as spelt! As the gluten protein can be difficult to break down in small doses, once it’s been hardened and tripled in strength, then you can imagine how much harder the body has to work to digest it. Again, if your digestive system is struggling to break the gluten protein down effectively then the immune system will be activated to help out with the job. 80 to 90% of our immune system lives in the digestive system walls, to help protect us from pathogens, virus’s and all sorts of nasty’s that can come into our body via food from the outside world. So when there is an immune response to a certain protein like gluten, your body remembers it and over time the immune response can get stronger and stronger, especially if there is a constant influx of the gluten protein coming into the body. “I use to always be able to eat wheat products without any problems, but now I feel bloated and tired after I eat it”. If you are reading this and can identify with any of the signs and symptoms that I have mentioned and if you are wondering if you may have a wheat or gluten sensitivity then please see your GP to rule out coeliac disease. If the test comes back and it is all clear then consider trialling the gluten free elimination diet for the next 4 weeks and let me know how you go. If you have any questions related to gluten or wheat – or what on earth you can eat instead, then I’d love to hear from you! I know this is a big topic so I am happy to demystify it as much as I can so that you can feel confident and satisfied with your food choices, after all food is one of the most beautiful pleasures in life, so let’s keep it that way!